It’s not every day you get to rampage through the 1920s countryside in control of a fleet of giant mechs. Scythe is a new board game from Stonemaier Games. If the art up top (which is on the front of the game’s box) looks familiar, that’s because the entire game is based on a universe imagined by artist Jakub Rozalski, which we featured on Fine Art a few years back and which is now also getting a video game. It’s not, as you might have guessed, a war game! 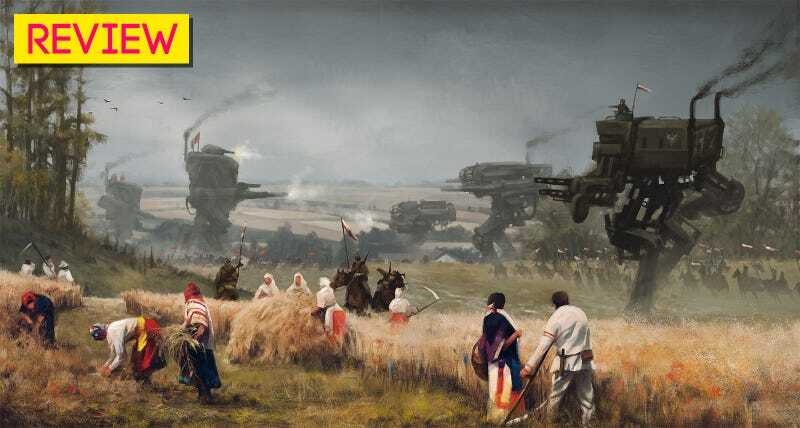 While combat does feature, Scythe—in keeping with the agricultural theme of many of Rozalski’s paintings—is actually about building and harvesting, with winners determined by how much stuff you’ve pulled out of the ground and how much money you’ve made, not how many battles you’ve won. While it looks a little daunting initially, with so many pieces and rules and terms on your player cards, I found Scythe a pretty straightforward game, and was totally on top of things halfway through my first playthrough. Indeed, navigating these player cards (large cardboard mats which show your current status) is perhaps the toughest thing to get your head around, and easily the weakest part of Scythe’s design, as the inconsistent way they’re designed and laid out is very confusing. The ease of the overall experience should be familiar to anyone who has played strategy video games. The way players must expand their territory, get more workers, build military units and harvest resources should feel second nature to veterans of everything from Civilization to Age of Empires. The faction mat, which displays the various perks and upgrades you can obtain over the course of a game. Not that Scythe’s play is as simply as clicking on a space and having a worker head there. There are loads of cool little rules and touches to the experience that make this an interesting challenge. For one, exploration is more than just moving tokens around the map. On many empty hexes you’ll find encounter tokens, which when landed upon ask you to draw a card presented with an event you’ve run into and three possible actions you can take in response. Some involve a small, safe reward, others a risk (or large payment) for a big one. Which makes the early stages of Scythe fun, but the real game is in harvesting and trading for resources, because it’s how you pay for buildings, units and upgrades. Each hex only produces one type of resource, so you need to hold down multiple hexes. Only, getting hold of hexes isn’t as easy as simply moving into them. For starters, the resources that are stockpiled on a hex aren’t bound to it; players can retreat from an area and stash the grain/wood/metal stockpiled there inside a mech, moving it out of harm’s way. And if combat did take place to decide ownership of it, there’s rarely a clear winner; losers must retreat all the way to one side of the map, but winners (at least in combat involving the displacement of workers) suffer a setback to their “popularity”, one of the game’s key victory metrics. This means that expansion and production are a very tense and delicate thing, making things far more complicated that just building an army and rolling it across a map. You can fight, and are rewarded for it, but you need to weigh up very carefully where and how often you’re going to resort to it. Making your planning even more chaotic is the fact that each turn, players are restricted to only one major action, and for their next turn, they can’t (one faction’s special perk excepted) repeat the same one. If you want to move, you can’t also produce resources. If you want to trade, you can’t fight. And if you moved last turn, you can’t move again for your next turn, you have to do something else. This is a cool mechanic for smaller games, where player turns roll around more frequently, but I found that in larger battles (the game currently supports up to five players) it got a bit frustrating having to wait so long for your turn to come around only to be able to do half of what you wanted to do. One of the Automa cards, which is basically the AI’s programming for singleplayer mode. One way around that wait is to play solo. In a weird but welcome move for a game this complex and unpredictable, Scythe ships with a singleplayer mode. Developed with the help of designer Morten Monrad Pedersen, Automa mode (as it’s called) essentially serves as an AI opponent, using a deck of cards to simulate the actions and behaviour of an actual rival. It’s not perfect—they had to cut out some basic rules to keep operating it simple, and it obviously lacks the cunning and reactions of a human opponent—but it works, and is a great way to learn the ropes before getting a crew together. Scythe is a beautiful game. Rozalski’s artwork and world building make for a unique setting, and Stonemaier’s work on bringing it all to life is to be applauded. Cards have a premium feel, the map looks great and player mats are thick and covered in gorgeous art. A selection of Scythe’s beautiful miniatures and the fancy resource tokens from the fancy version of the game. 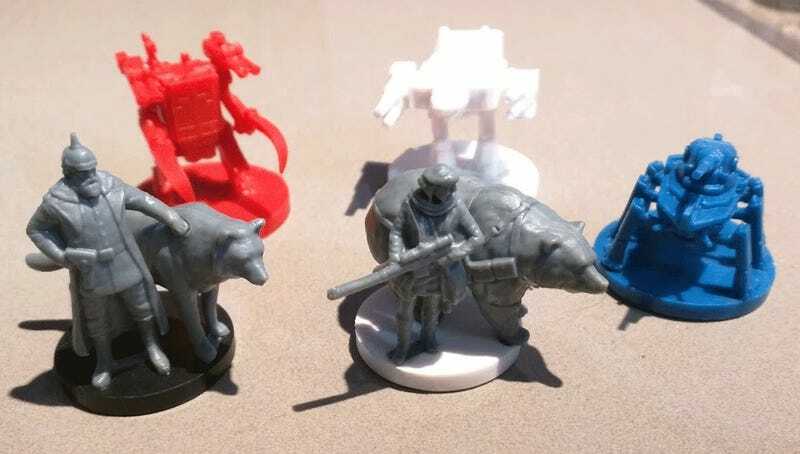 The game comes in a few different editions, but even the basic one has detailed plastic miniatures for each faction leader (a super unit you can move around) as well as the four mechs you’re able to build. The fanciest edition, however, goes all out. The resource tokens for metal are actual metal bars, the game’s currency is made from metal coins and its grain tokens are detailed, painted little ceramic sacks of grain (note these premium features are available separately as add-ons if anyone wants to upgrade later). Which doesn’t sound like much, but in a world where most board games are content to handle currency with cardboard tokens or cheap paper, there’s something wonderfully tactile about constantly handling the heft and jingle of “real” money. I’m really impressed with this game. Its blend of resource gathering, exploration, turn management and combat results in a conflict that’s entirely unpredictable. Because the game isn’t just about fighting, or just about farming, there are multiple approaches to confronting your opponents and winning the game, which makes for a fascinating struggle, and a game that plays out differently every time you get it out. The five factions—based on Poland, Germany, Crimea, Scandinavia and Russia—you can choose from. Two more (based on Britain & Japan) are coming soon. Even the end is cool. Instead of Scythe concluding in a slow, predictable march towards the finish line, there’s a certain point where the game ends, but that isn’t where the winner is decided. Instead, once that point is reached, that’s the time when everyone tallies everything they’ve done, from victories in battle to resources harvested to the amount of territory owned to how popular their factions were. Only then, at the very end can a winner be determined, and it was fun seeing how often the results you’d get from this final tally would be a surprise, with apparent front-runners pegged back by less obvious—but just as important—efforts from other players during the game. This makes the pacing of the game feel nice and consistent. There are never really any lulls in the action, or mad sprints; the design produces a constant stream of options and actions available to you and you just chip away at them in an order of your choosing for the entire game. It’s rare a brand new game with an original IP can force its way into my board game crew’s rotation of titles, as stacked as it is with stuff like Star Wars games, but Scythe has marched straight in. The combination of its art design and flexible playstyles has me keen to chip away at different factions and ways of playing, and I think we’ll be playing this for some time to come (especially since there’s already an expansion with two new factions on the way). Scythe is shipping out now to people who backed the game on Kickstarter. For everyone else, it’ll be available at retail in August.